From George Palaganas: I have made a labelling for those whose names I know on this photo at http://www.facebook.com/photo.php?fbid=2176995470906&set=a.1212582641188.2032545.1427450153&type=1&theater . Just supply the ones I haven't recalled. From Vic Pontanilla: Hi Ditas! Msta na? Yup para akong kawayan dati sa payat...but look at me now,napabayaan na sa ....hehehe...Regards! From Rowena Valenzuela: thanksl lani...grabee katuwa ang pictures natin. From Cynthia Bartolo: thanks, Lani! From Roy Sotelo: Thanks Lani... katabi ko Henry Caerlang I'm sure kilala nyo sya. From George Palaganas: Look at those feet... LOL! Thanks for this "precious" memento Lei! From George Palaganas: Just like Maurice(Arcache), my lips are sealed... sometimes! LOL! 1.Luzviminda Angco, 2.Consorcia Agustin, 3.Maria Antonio, 4.Norayda Baybay, 5.Yolanda Bugagon, 6.Merinda Dizon, 7.Ruby Flores, 8.Annabelle Garbin, 9.Evelyn Mamucod, 10.Victoria Manalo, 11.Emelyn Manuel, 12.Evelyn Obcena, 13.Rowena Ramirez, 14.Natalia Ramos, 15.Vivian Sacatani, and 16.Fatima Valdez. 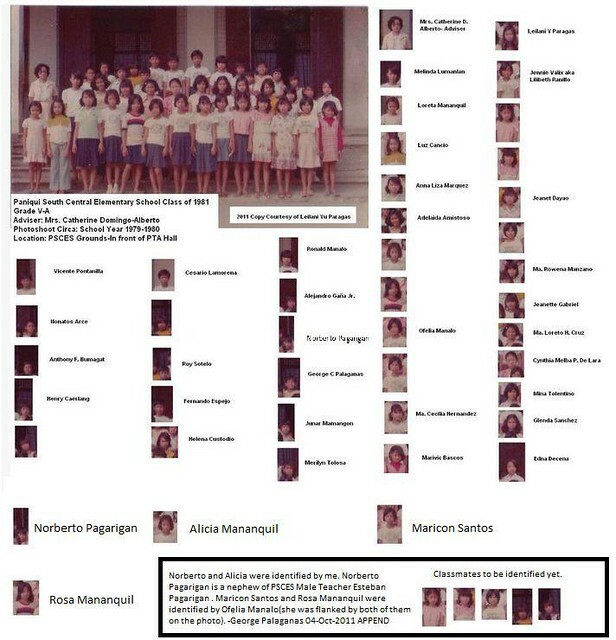 From George Palaganas: Do you remember sa section yatang ito meron nung nagpakasal dahil nabuntis niya yung classmate niya? Purity, baka sabunutan ako ng mga advisers dahil sa "leak" na ito! May Family Code pa naman... LOL! From Cynthia Bartolo: Grade 6 tayo? 12 or 13 y/o pa lang tayo nun. I doubt it, George. Baka sa Highschool, pwede pa. Chismosa ako, ah, pero bakit di ko yata nabalitaan un? Nora T. Domingo and 72 other members were added by George Palaganas. From Vic Pontanilla: Kudos to Cyndee,Weng ,Mael , Jerome and Ninoy... Galing ninyo classmates! From Cynthia Bartolo: ALL THANKS to Millet Vinluan Cruz, and to her mother, sa kanila namin nahiram yung original ng Graduation Program na ginagamit natin ngayon. Thank you po! From Ronald Manalo: Unbelievable! Andami kong Hindi kilala sa mga ka-batch natin especially from other section. I wish ma meet ko silang lahat!.. Thanks Cyndee et.al for the list. !